Explore Sun Moon Lake, Taroko Gorge, Kaohsiung and Taitung on this private 5-day tour from Taipei. Visit Fo Guang Shan Monastery on the shore of Sun Moon Lake with your private guide. Take in panoramic views over remote beaches and rugged coastline in Kenting National Park and Taroko National Park. 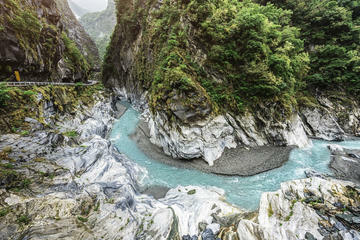 Trek over the marble cliffs of Taroko Gorge and indulge yourself with a relaxing soak in the natural hot springs. Discover the bright lights of Kaohsiung city and mingle with the locals at the bustling Lio Ho Night Market. Michael our tour guide was amazing.